Last week, I watched some very moving clips of customers of Imperial Bank who lost their investments and life savings when the bank was closed on October 13, 2015. 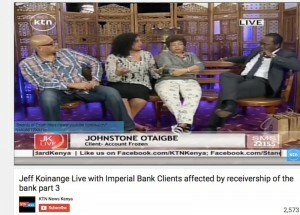 The Jeff Koinange Live TV show (part 1, 2, 3), featured three different depositors who spoke of their shock on getting the news and the impact that the last month has had on their families, businesses, and plans for the future. Jeff and the business lady had a light moment when they realized they had both been customers of Diners Bank which collapsed in the mid-1990’s and in which she lost Kshs 200,000 (a large amount then) that she never recovered. How cruel was it then that she was going to lose money in another collapsed bank that offered good rates and good services twenty years later, but which also collapsed? You could see the depositors frustration with the process over the last month since the closure. They were at times angry with the Central Bank of Kenya Governor, the shareholders of Imperial Bank, the directors of Imperial Bank, the companies that took illegal loans from the bank, and the auditors of the bank. They kept asking how did Kshs 34 billion ($333 million) vanish in fifteen years and none of these regulators and guardians at the bank not realize something was amiss? How could they allow a bank to operate that even took in their money the day before it closed? They were doubly frustrated on hearing of plans being formulated over the last month for the bank, with little involvement, or communication, to them as depositors. Why is the bank not open when the Governor said it would resume in a month? Why can’t the government allow controlled withdrawals by the ‘legitimate’ deposits and customers? Why has the (new) bank CEO not made a statement, and Is he even in the country or has he fled to Canada like the CEO of another large collapsed bank? Why has the Central bank not involved depositors in their talks with the shareholders and directors of the bank? Etc. What’s been in the news seems to have taken the bank further back from reopening including revelations of “off the books” loans, some of which the takers have offered to partially return. The Kenya Deposit Insurance Corporation [KDIC], who insure all depositors up to Kshs 100,000 [$980], have asked customers to ignore fraudulent emails asking them to convert their deposits into shares at the bank in their desperation to get the bank reopened. There have also been stories of there being a Kshs 40 billion hole at the bank, and shareholders only offering a quarter of the amount, while insisting that they want immunity before they place the money in. In addition the family of the former CEO, who’s widely blamed for the bank fraud, are now denying that he stole money, and shareholders of the bank also blaming the Central Bank for failing in its regulatory and oversight role at Imperial which won numerous awards for growth, finances, customer service and marketing. Shareholders of the bank want to sue the companies who had borrowed off the books, and depositors want to be included in cases as they also accused the government of being slow in reopening the bank and for being lax in oversight. The outlook for Imperial Bank is not good. 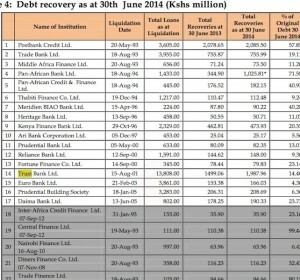 Even if the estimated Kshs 43 billion in ‘official’ loans, along with the Kshs 17 billion of government securities Imperial Bank had, and whatever amount is in ‘unofficial’ loans, are recalled and paid, the official amount owed to depositors is Kshs 60 billion. But the day the bank doors reopen, you can expect all the depositors to run to the bank to draw their funds in full. They will not be banking at Imperial in a week’s time and are unlikely to ever entrust their funds to the management or shareholders of the bank ever again. The same goes for other banks, and financial intermediaries, who rely on trust and confidence as a basis for banking relationships. The current issue of the East African compares the situation at Imperial to Trust Bank which was placed in receivership in 1998. It briefly reopened after depositors converted their funds into shares at the bank, then again shut down, this time permanently, in 2001 after finding it hard to win new business. The only way for Imperial Bank to survive is if it is bought out by a large, multi-national, or regional bank. 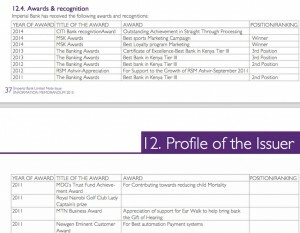 That bank will have deep pockets and will have done its due diligence on the true value and exposure that Imperial Bank carries, and received a waiver of obligations above an agreed threshold and from additional liabilities, prior to their agreeing to buy the bank. And if such a deal happened, the new bank will want to take on the Imperial customers and business but erase all traces of the Imperial Bank name, forever. 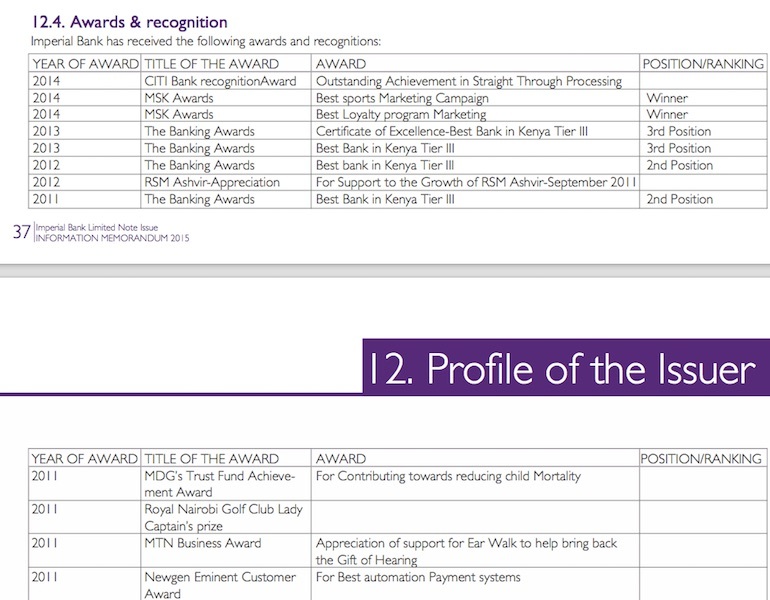 This entry was posted in CBK, Imperial Bank, NSE investor awareness, receiverships on November 30, 2015 by bankelele. It is interesting to see that average debt recovery rate over 15-20 years is a dismal 28%, with only 4 bank receiverships recovering over 50%. That is the big lesson here, most people get away with it and you better diversify your funds away from the small to medium banks. By the way, where are this figures from? Central Bank reports? 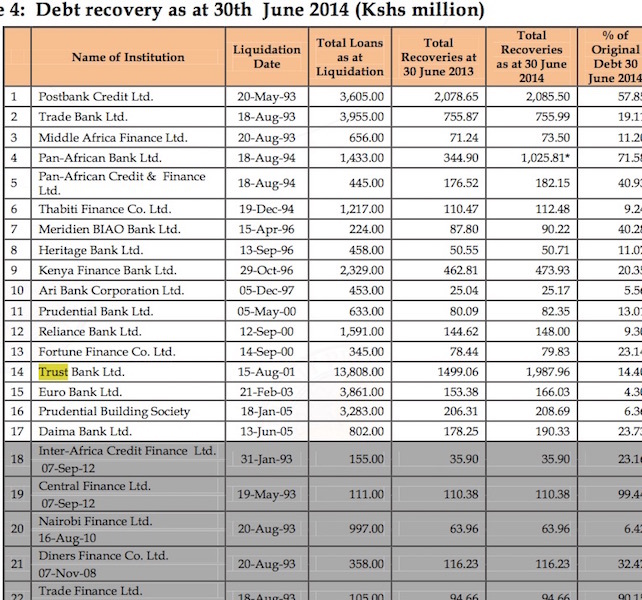 The old bank recovery figures are from the 2014 KDIC annual report.